On 23rd April 1915 the Lahore Division moved at short notice to the area to the south-west of Ypres in Belgium. This was in response to an attack by German troops the previous day at Langemarck, using poison gas for the first time. By the night of 24th April the British line was re-established but the position remained critical. The Lahore Division was thrown into the battle north-east of Ypres on 26th April in an attempt to recapture some of the ground lost in the initial German attack. 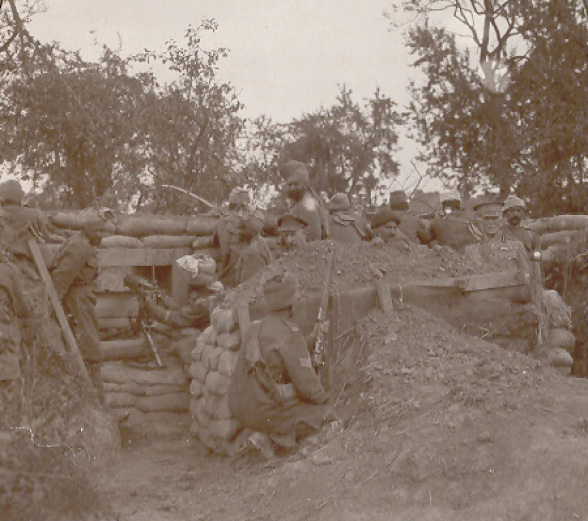 The Indians suffered many casualties on the way to the front line owing to the exposed nature of the approaches and the good observation held by the German artillery. The Germans also had a substantial superiority in terms of numbers and were again able to make effective use of gas. Although the attack was not successful in regaining lost ground it did effectively halt the German advance and protected the town of Ypres which remained in British hands for the rest of the war. Indian Corps casualties in the action amounted to 3889. After the fighting at Ypres the Lahore Division rejoined their comrades in the Neuve Chapelle area further south, ready for a further British attack. The Battle of Aubers Ridge started on 9th May, the day that the Lusitania was sunk by a German U-boat. The attack was launched in conjunction with the French and was intended to capture the high ground behind the villages of Aubers and Neuve Chapelle. 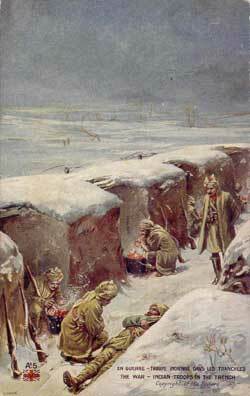 Unfortunately, since the Battle of Neuve Chapelle the Germans had strengthened their defences and brought up supplies of ammunition. 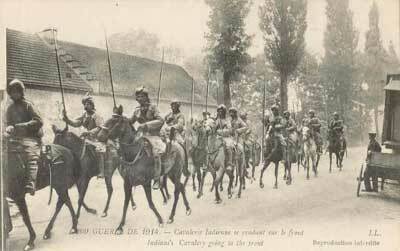 The Indian Corps fought alongside the First Corps which included two battalions from the Royal Sussex Regiment. Both suffered very heavy casualties and the attack failed. The German defences had proved too strong and the British bombardment inadequate. Total British losses amounted to 11,619 men. 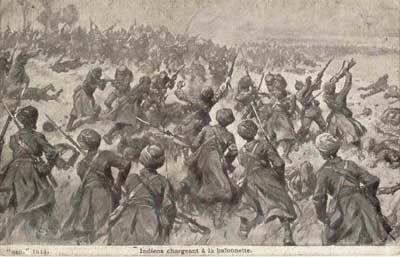 The Battle of Festubert was the last major action in which the Indian Corps were involved on the Western Front although they were also involved in a supporting action to the Battle of Loos in September 1915. The Battle of Festubert was part of a wider action involving the French which was intended to cause a general withdrawal by the Germans along a significant part of their line. The battle was undertaken by the British First Army with the Meerut Division operating on the left, close to where the Indian Memorial at Neuve Chapelle is now located. The 2nd Division was in the centre and the 7th Division was on the right. The offensive was to have commenced during the night of 12th May but was delayed until the 15th due to adverse weather conditions. 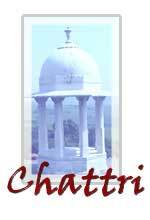 The Indian Corps and the 2nd Division had to attack under cover of darkness and the 7th Division at daybreak. Opposite the British stood the 7th Prussian Corps recruited from the mining and industrial districts of Westphalia. They were in a high state of alert and shouted confidently “Come on, we are ready for you” when they were within earshot of the British troops. At 11.30 p.m. on 15th May 1915 the attack commenced and the night was immediately lit up by German searchlights, flares and fire-grenades supporting their snipers and machine gunners. 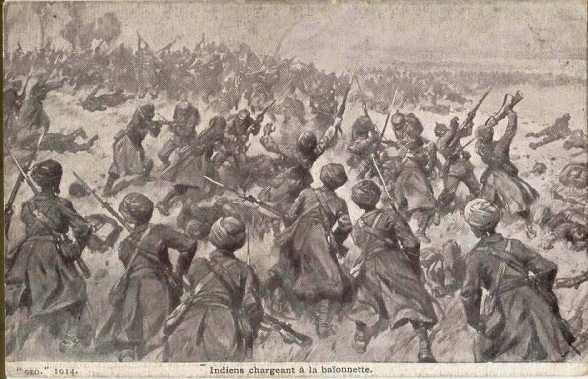 The Indians were quickly immobilised and the 2nd Division who managed to make some progress had to stop so that they could maintain contact with the Indians. However to the centre and right the attack proceeded right up to the German second line, a gain of 600 yards along a front of 800 yards. At 3.00 p.m. on the 16th the 7th Division began their attack on the far right of the line towards the village of Festubert. After a hard day’s fighting they had also reached the German second line. However by nightfall on the 16th the attack of the Indian Division had to be suspended in view of heavy losses and lack of progress. Fierce fighting continued on the 18th and at the extreme north the Indians managed at last to advance, although elsewhere little progress was made. The battle reduced considerably in intensity on the 19th and by the 20th it had effectively ended. The ground won covered an area of four miles to a depth of 600 yards. The British losses (16,648 men) were very heavy for such a small gain and considerably greater than the German losses of approximately 5,000. At the beginning of September 1915 the commander of the Indian Corps Sir James Willcocks was replaced by Lieut.-General Sir Charles Anderson. 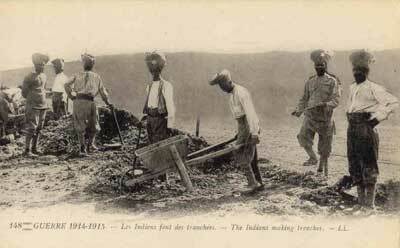 Later that month the British undertook a major offensive at Loos, several miles to the south of the Indian Corps. In support of the Loos attack the Indian Corps was asked to undertake an assault of their own north-east of Neuve Chapelle, with the intention of preventing the enemy from sending reinforcements to the south. In addition to an infantry assault the attack involved a long artillery bombardment, a mine explosion and a gas and smoke attack. In the event, weather conditions made the gas and smoke more of a hindrance than a help and the German wire remained uncut notwithstanding the heavy bombardment. 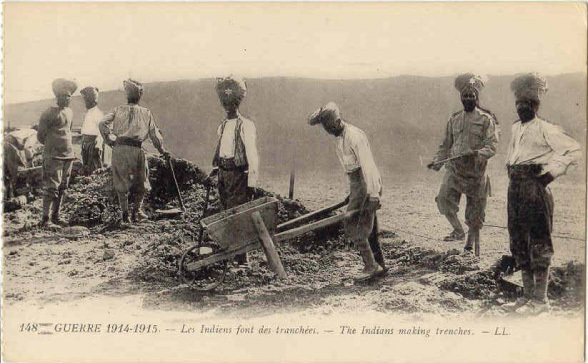 The heavy casualties that the Indian Corps had suffered since their arrival in France (in excess of 34,000 killed, wounded or missing) and the difficulty of finding suitable replacements meant that by the end of 1915 it was well below its original fighting strength. The Corps was therefore notified on 31st October 1915 that it was to move to other theatres of war closer to its base. 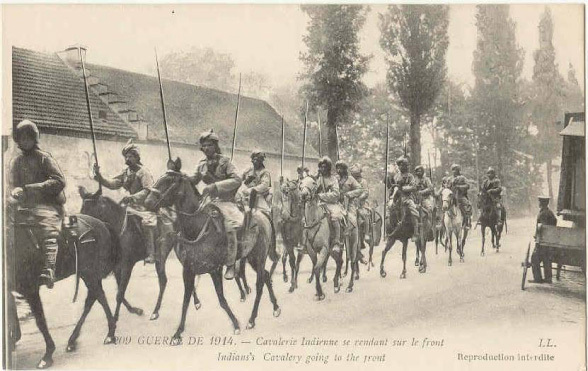 By an order from GHQ on 8th December 1915 the Indian Army Corps ceased to exist and on the 26th December the last troop transports carrying troops of the Indian Corps left Marseilles. 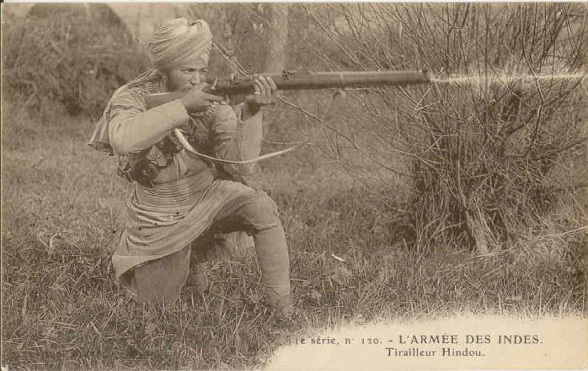 The Lahore and Meerut Divisions of the Indian Army served out the remainder of the war in Mesopotamia (modern Iraq) and Palestine (modern Israel and Syria).